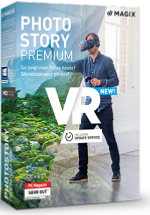 PhotostoryPremium VR includes all features from Photostory Deluxe plus virtual realityfunctions and bonus premium-quality effects. Easily create virtual experiences andthen share with others. All you need is your computer - nothing more! You caneven use a VR headset but it’s not required.